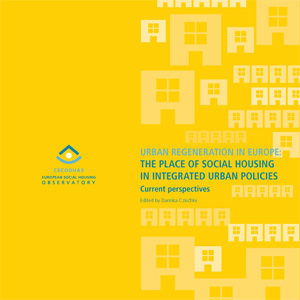 Nicholas Falk contributed an article to the CECODHAS publication Urban Regeneration in Europe: The Place of social housing in integrated urban policies . The collection of essays includes work by Karien Dekker, John Flint and Gerard Van Bortel. For his contribution, Nicholas summarised research URBED had done for English Partnerships and the Housing Corporation on the subject of managing mixed communities. We summarised a large body of research, which showed that despite the benefits that are often claimed, there can be real issues in managing and paying for the communal areas, and avoiding conflicts. As well as the issues of settling in which affect any new community, problems can arise when those who are most vulnerable are sent to live in places that lack facilities such as shops and public transport. Conflicts can arise at three different spatial levels: domestic, communal and neighbourhood, with different sets of challenges for areas undergoing estate renewal, area regeneration, brownfield and greenfield development. Lessons were drawn from six different case studies, which ranged from Caterham Barracks and Greenwich Millennium Village to Atwood Green (now Park Central in Birmingham, and the New Gorbals in Glasgow. URBED with support from experts at the University of Westminster then drew up a good practice guide to help planners resolve the issues in advance of people moving in. The key messages involve meaningful partnership agreements, creative community involvement, quality housing management, and active neighbourhood management. Please see CECODHAS for their work and the full collection of essays.